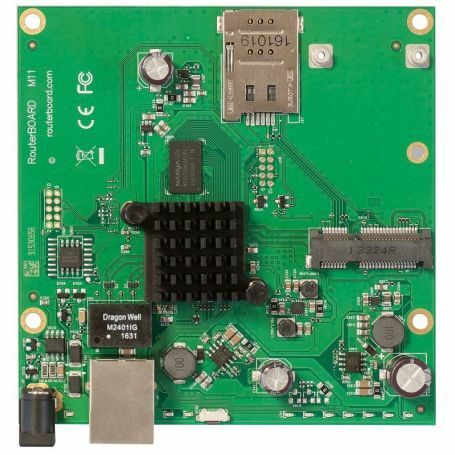 The RBM11G is a fully featured RouterBOARD device perfect for using with your enclosure or building a custom solution. It uses the same square PCB and mounting holes as it’s predecessors, you can swap out the older models with the brand new RBM11G. The M11 features a new MediaTek dual-core CPU running at 880MHz, a mini PCIe slot for using with a WiFi module of your choice, or with a 3G/ LTE modem (SIM slot provided). PoE can power the device through its gigabit ethernet connector or the DC power jack.